Years ago it was cigarette lighters that concertgoers held aloft -- either to call for an encore or just to keep time with the band during slow songs. These days, it's the screens of cell phones that light up the night. 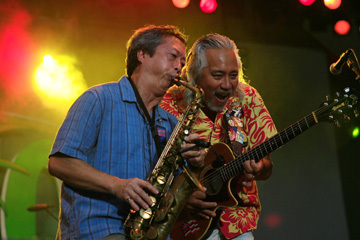 The Birthday Bash audience raised their phones to sway in unison with Kapena on Saturday. 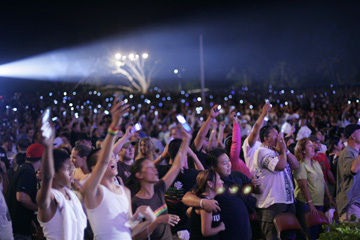 KCCN-FM threw itself a rollicking 16th-birthday party Friday and Saturday nights at the Waikiki Shell. The New Zealand reggae band Katchafire headlined both nights, but a full roster of local rock 'n' reggae heavyweights filled out the two nights of music. Brother Noland jammed with saxophonist Tim Goshi, above, on Friday. 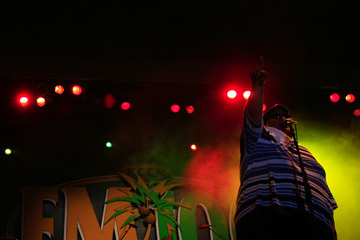 KCCN-FM deejay "Lina Girl," screaming, pumped up the crowd Saturday during the second night of festivities. Lukela Keala of the band Ekolu worked the crowd on Friday night.